Although web designing is a promising field, it is incredibly challenging too. If you want to be successful in the field of web designing then you must have enough technical skills with some creative skills to be a successful web designer. If you are working in the field of web designing then you must be able to learn new technologies. It is because, with the advancement of technology, the field of web designing is being improved with every passing day. But learning new technology does not mean that you are going to forget the skills you have learnt before. But you have to develop those too with time to be master in them. It will be something like you are learning photoshop to be master in and trying to learn a new tool too with that. If you want to be successful as a web designer then you need a lot more than just being good in creating designs or having the knowledge about the right technologies. There are a lot of things in the field of aspiring web designers and these are the things on which you need to work to make your professional portfolio strong. By having a better idea about the things that you need to learn to make an inspiring web design. The challenge that a lot of web designers may face in the present days aside from balancing the load of a lot of information and making an eye-catching website design is to manage the professional lives in an effective way. The responsibilities of a web designer are not limited to making an inspiring website design only but need to learn the management skills too which are necessary for successful business. 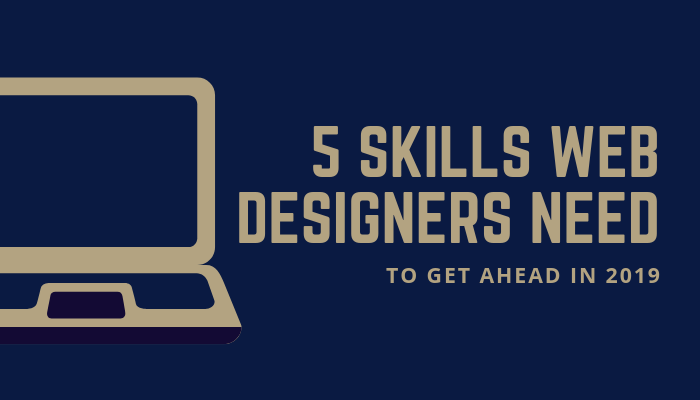 These skills can vary from the designing skills to different essential communication and marketing skills. As an expert website designer, you have to be professional in the field of web designing and need to be skilled in each and every step you are going to take. Following are some skills that you need to learn for being successful in the field of website designing. One of the most important skills that web designers need to learn in 2019 in the UX design skills. UX means user experience and you should know that in 2019 the customers comes first. If you are unable to design a website that will provide better user experience you will not be able to succeed in the industry. Every website that you develop should be focused on the customers. You should have the skill to design a website in a way that will help customers enjoy using the platform. Make sure that you improve our skills with changing technology to assure you can update the platform and make it interactive. There are a lot of designers who are the best in their creative skills but do not know how to manage their time effectively. It is because a little planning about your time will help you to achieve your desired things really quickly. It is always beneficial to research and plans the things before starting the work of web designing for effective time management. It seems so obvious to learn the design knowledge to be a website designer but to focus visual design on the digital devices might look different than what you expected. For this, you must have the skills to identify that what your design is going to look on different digital devices and what will be the feel of the site. The visual design is the best chance for you to dig into some creative mood boards, experiments with the web color pallets and fonts and type hierarchy. You must have demonstrable Graphic design skills to bring the most inspiring designs out of your mind. All the web developers who are trying to go ahead in 2019 need to know how to build mobile-first websites effectively. To have the skills of building responsive websites for different screen sizes and shapes is really necessary at present time to be successful in the field of website designing. If you are going to build a website which looks amazing at your desktop but looks like garbage at other mobile devices then you can never make your clients happy with the skills of your web designing. You can see the amazing web designs at Boston web design company to get better help. If you really want to be successful in the field of website design then you need to develop some characteristics and traits, some of them you may already have and some of these you may need to learn gradually. These are the traits which you can’t embrace just by attending classes regularly or reading informational books. These are the skills which will take some time to cultivate. But if you have developed these skills than nothing can stop you from being successful in the world of web designing.